They turned the page on age. 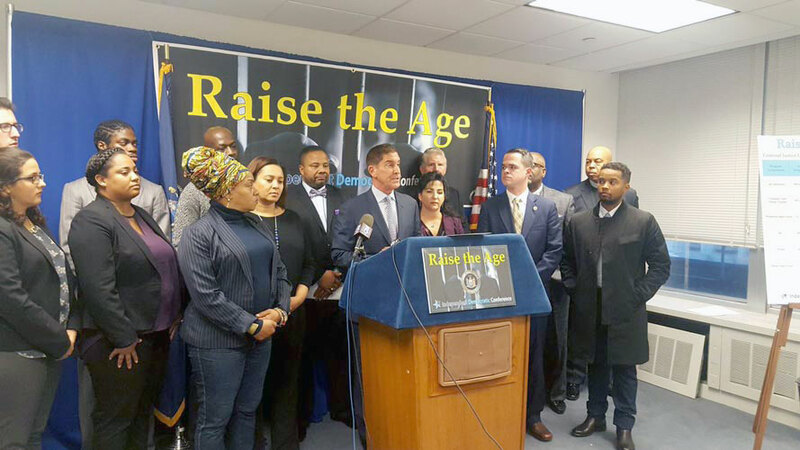 Advocates and lawmakers on a mission to make the “Raise the Age” plan the official law of New York State saw their efforts come to fruition on April 10, as Governor Andrew Cuomo signed legislation to raise the age of criminal consent to 18. 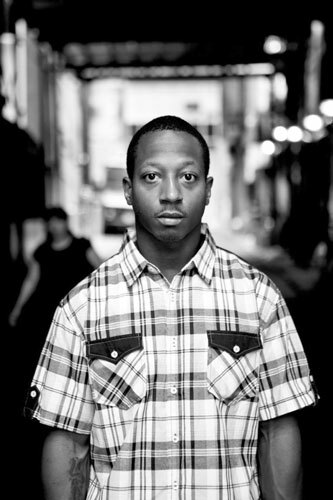 “Stories like Kalief’s [should be] made into a command for reform,” said Akeem Browder. New York had previously been one of only two U.S. states, the other being North Carolina, that processed 16- and 17-year olds through the criminal justice system, regardless of offense. The new legislation, part of the 2018 state budget, will ensure that non-violent young offenders will avoid being placed on Rikers Island and receive better intervention services. Under the new law, 16- and 17-year-olds facing misdemeanor charges will be tried in Family Court. Cuomo conducted the signing in East Harlem during an event at the NYC Mission Society, where he was joined by Rev. Al Sharpton and Akeem Browder, brother of Kalief Browder. The event was witnessed by numerous elected officials and criminal justice advocates. “This was a hard one. This was tough,” remarked Cuomo of efforts to pass Raise the Age legislation, noting that the proposal was first put forth 12 years ago. The new measures will be phased in over time, raising the age of juvenile delinquency from age 16- to 17-years-old beginning on in October 2018, and subsequently raising the age of criminal responsibility to 18 in October 2019. Young people will no longer be permitted to be housed in adult facilities or jails. Cuomo remarked that the story of Kalief Browder, the 22-year-old Bronx man who committed suicide after spending three years on Rikers, often in solitary confinement, served as the catalyst for getting the legislation through. “This bill says that Khalief Browder did not die in vain,” Cuomo stated. “It is my family’s hope that stories like Kalief’s are made into a command for reform of the criminal justice system,” said Akeem Browder. Cuomo vowed that young people under the age of 18 will stop being held at Rikers no later than October 2018. Instead, offenders would be placed in specialized juvenile detention facility certified by the Administration for Children’s Services and the state’s Office of Children and Family Services, and in conjunction with the state’s Commission of Correction and the New York City Department of Corrections. State Sen. Velmanette Montgomery has sponsored the legislation since 2012. 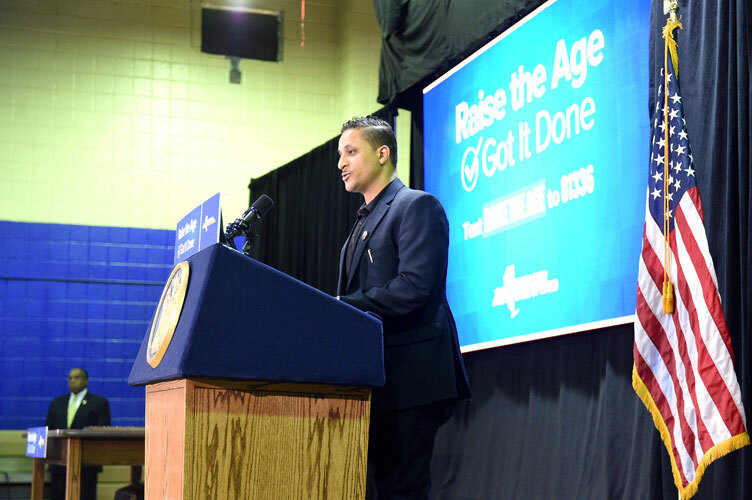 Cuomo insisted that state lawmakers had wanted to drop the contentious Raise the Age plan from the budget in order to get a new budget passed. He said that in addition to raise the age, the new state budget contained “a lot of smart things,” including legal defense services for immigrants and free tuition at CUNY and SUNY for families with annual incomes below $125,000, measures he said other states would try to duplicate. “You watch the other states start to copy what we do, because it’s smart, it’s common sense,” he commented. 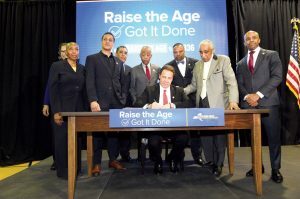 Cuomo explained that non-violent offenders who do not commit a crime for 10 years will be eligible to have their records sealed, a move he said would remove a “scarlet letter” on young people’s records which often served as a barrier to getting employment. Some supporters were more measured in their support for the final bill, which ran over 25,000 words. Advocates insisted that the new legislation would change the lives of many youths who were unnecessarily tried as adults. State Sen. Jeff Klein (center) supported the bill. “I think this is a victory,” she added. Rev. 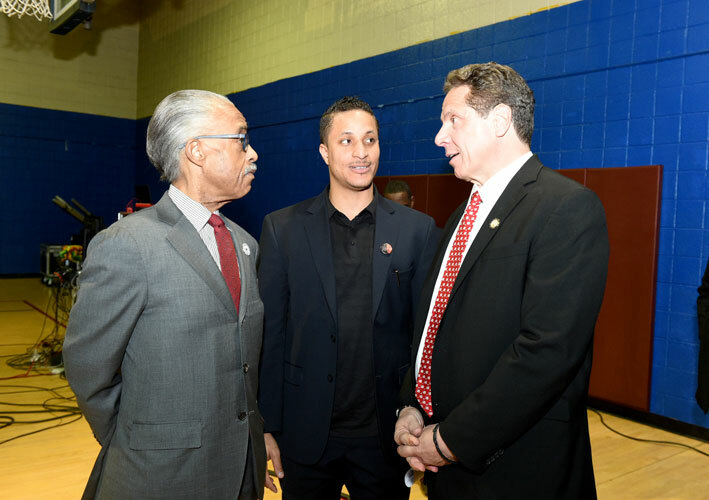 Al Sharpton (far left) with Akeem Browder and Gov. Andrew Cuomo. She said that while it was important to keep young people off Rikers, the city needs to also bolster its court system.